"You try to fix what's broke, you'll go insane"
It was nearly two decades in the making, but 'Mad Max: Fury Road' seems to have arrived when we needed it the most. In a world where we are so accustomed to theaters usually housing one or more action blockbusters at any given time, the multimillion dollar films that are filled to the brim computer generated imagery, where most of the visuals you are witnessing are done in post production, it's such a giant jolt to the senses to see a film which utilizes such a vast amount of practical effects, and more importantly, to see a film that personifies that genuine movie magic feeling, 'Fury Road' is that film. This film is a template of how to create a successful reboot/re-imagining without alienating fans of the original. Capturing the essence and spirit which resonated with folks the first time around, but molding it into an all new vision that can stand separately from its predecessor. George Miller has an advantage when it comes to this, due to the fact that he is re imagining the world and character he originally created, but its still astounding how far his vision has traveled, initially beginning in the late 70's with a young Mel Gibson roaming around Anakie Road, to 2015 with the ginormous, extravagant war on wheels in 2015. It's also admirable that Miller's creativity isn't blocked by what he's done in the past. He could have easily made a film that acts as a companion to his originals and carry on that story arc, but instead he has crafted an entirely different take on Max Rockatansky, and 'Fury Road' is all the better for it. 'Fury Road' is one of the most alive action films I've seen in a long while. It feels like a living, breathing beast that has manifested itself on the big screen. The film is so ferociously energetic and, like Max himself, is always on the move. The action sequences are truly awe inspiring and will leave you breathless. Without exaggeration, I genuinely had to take a giant breath after a huge sequence, it was that exhilarating. Miller has always had an amazing understanding of how to create thrills on fast moving transportation, both when he as no budget and when he has a huge one. The stunts in this film are just unbelievable and make you wonder how the hell they were able to pull them off. In many ways, 'Fury Road' is like this generation's version of 'The Road Warrior'. The drifter, Max, joins forces with another group and attempts to help them achieve their goal, all the while facing giant adversity from a larger group headed by an intimidating foe. But, as I alluded to above, it never feels like Miller is giving us the same film with a nice new bow, he's created something that will appeal to those who grew up with 'The Road Warrior' and those younger movie goers who probably wouldn't appreciate watching the 1981 film today, it's an excellent balance. 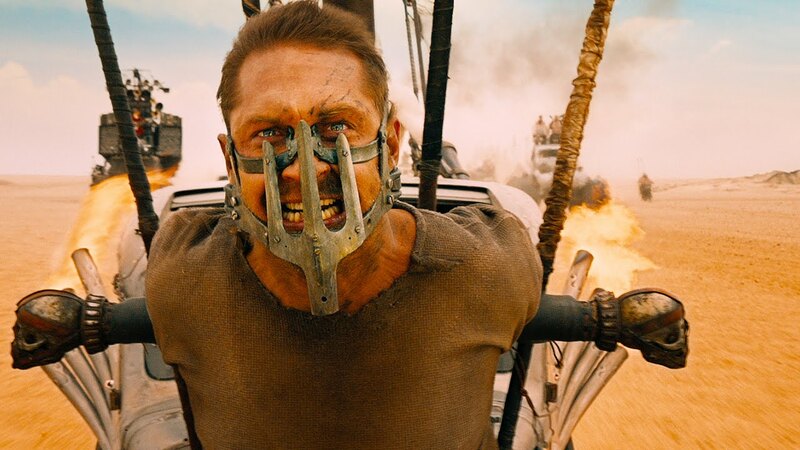 Tom Hardy was the ideal choice to play a modern day Mad Max. Not only is he an immensely talented performer but his gruff and softly spoken persona fit the legendary character to a tee. He does a very good job in this film, he's a badass yet vulnerable to his past shortcomings, and constantly tortured by visions of those he has failed to save. I hope we get another chance to see him play the role in the future. Charlize Theron is absolutely amazing as Furiosa, an enigmatic yet humane performance that is more than worthy of awards consideration. Theron is a goddamn national treasure and one of the most valuable actresses we have today. The rest of the cast is who's who of Australian performers, both past and present, and there really isn't a weak link, everyone does a good job. I revisited 'Mad Max' & 'The Road Warrior' last week (but not 'Thunderdome') and after having seen 'Fury Road' today, I think I can comfortably say that this is definitive vision of the Mad Max universe. It's depiction of the dystopian futuristic wasteland, ravaged by the apocalypse, leaving behind a world of savages and survivalists to exist by any means necessary, is the unmatched portrayal of Max and the world he lives in. 'Fury Road' is an endlessly riveting experience, with some of the most unbelievably awe-inspiring action sequences I have seen in years. A fun and ferocious ride that will take a hold of you instantly and won't let go until the credits roll. What a lovely day, indeed!